If you have some old sweaters that are worn out, there are many creative ways for you recycle and reuse them. 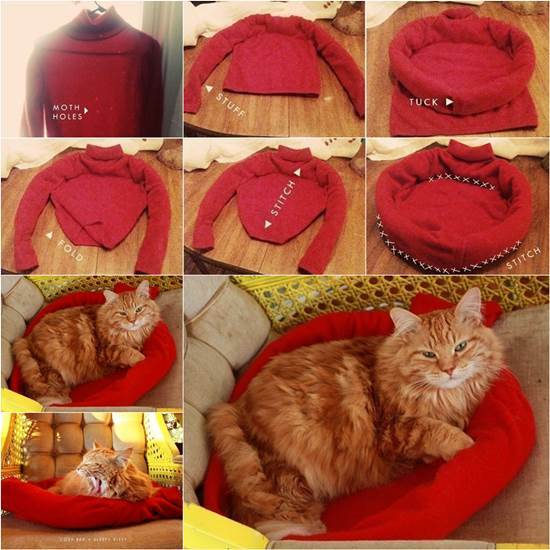 Here is a super cute idea to make a cozy cat bed from an old sweater. It is great for the little furry member in your household. Look at how this cute kitty enjoys its new bed. It works for small dogs too. It’s very easy to make. Simply take the sweater and stuff the sleeves with polyester fiber filling. Tuck the sleeves into each other to have an idea of the size of the cat bed and fold over the extra. Finally sew around the base of the cat bed and here you go. Let’s make it for our pets so that they’ll have a nice place to rest and relax!